AGNÈS VARDA'S SUBLIME DOC FACES PLACES plus THE 2017 MURIEL AWARDS BEGIN! 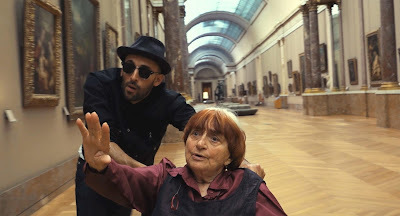 If Faces Places, the latest documentary from French Nouvelle Vague legend (some call her the Grandmother of the French New Wave) Agnès Varda, has anything up its sleeve, it is the capacity to surprise. The film, known in its native language as Visages Villages, was made in collaboration with the Parisian street artist/photographer JR, took prizes for Best Documentary from the Cannes Film Festival as well as just about every American film critics association, and it is in serious contention two weeks from now to walk away with an Oscar. Varda, at 89, is already the oldest Oscar nominee in the history of AMPAS, and she might end up being the oldest winner too-- not that she, as befits a maverick of one of cinema’s most influential movements, gives much of a rip about such a landmark one way or another—“I’m just saying I’m not dead yet,” she remarked on the occasion of learning of her Oscar nomination. At 89, she is, of course, not as ambulatory as she once was, but even making her way with a cane across the fields and cobbled landscapes of her native country, with occasional respite in a wheelchair or on the nearest available bench, she still cuts a magnificent figure from which the long shadow of her career originates in the setting sun. That setting sun looms large on the horizon of the film, as it must, but its only one element in the design of Faces Places, a movie about memory and memorial that has the capacity to bring viewers (at least this one) to joyous tears with the power of first glimpsing, courtesy of a perfectly crafted cut, the audacious imagery conjured by JR, the way Varda contextualizes and enriches that imagery, and the effect it has on the people who live, experience, and are dignified and celebrated by it. And it's that spirit of celebration, of honoring the skills and sensibilities of the people who populate those French villages, that makes Faces Places consistently, delightfully surprising. The film is simultaneously a sort of touring art show—Varda and JR are in search of interesting working-class people with mundane, yet inherently fascinating stories to tell, and surfaces (walls, water towers, barns, et al) which can be used for JR’s particular brand of striking, transient commemoration—and buddy-buddy road movie, complete with comic jabs, frustrations, philosophical discussions, reverie and unexpected emotion. 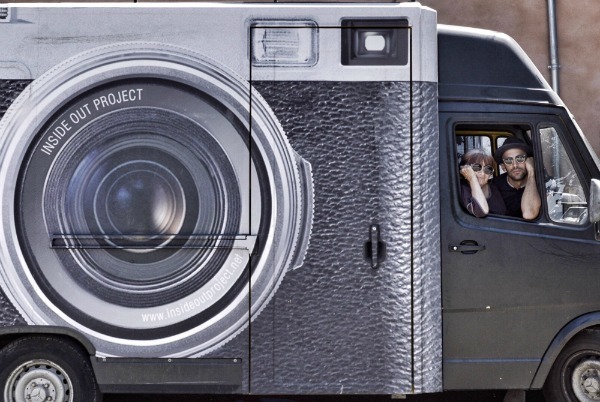 They travel the rural surroundings in JR’s van, which has been painted and sculpted to resemble a camera on wheels. That van houses a photo booth which spits out large-format photographs of the subjects who volunteer their visages to Varda’s and JR’s care. Their central purpose: to amplify the presence of people whose existence may verge on the anonymous but who occupy a central position in the beating heart of a country most prominently defined by its Parisian counterparts, and from that purpose Faces Places gracefully worms its way into the halls of memory, even into the meaning of the burgeoning friendship between the two artists separated in age by several decades and an unknowable gulf of experience. Of course, part of the movie’s terrain, as it has been with many of the director’s late-period documentaries such as The Gleaners and I and The Beaches of Agnès, is Varda’s experience, her memories of Jacques Demy, her late husband and director of The Umbrellas of Cherbourg, and of fellow artists like pioneering photographer Henri Cartier-Bresson (whose burial place in an unassuming cemetery overgrown with weeds, is one of the pair’s destinations); fashion photographer Guy Bourdin, whose image, adapted from a 60-year-old photograph taken by Varda herself, is rejiggered into the movie’s most impermanent image (and one of its most potent visual metaphors); and, of course, Anna Karina and Jean-Luc Godard, friends and peers of Varda and Demy, in their shattering and reshaping of cinema history in the late ‘50s and early ‘60s. 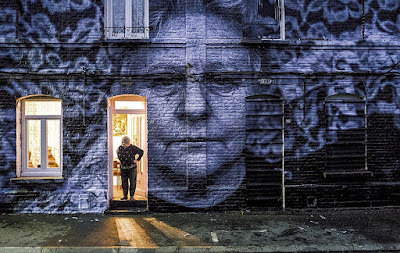 In the last third of Faces Places Godard’s shadow, or perhaps more accurately his ineffable spirit, like intangible mist, begins to hover over Varda’s narrative and her wistful recall. She notices, seemingly almost at the same time we do, JR’s physical resemblance to Godard—JR is never seen without his signature hat and, most significantly (and to Varda, annoyingly) sunglasses. Even his pseudonymous identification echoes Godard’s familiar initials, JLG. 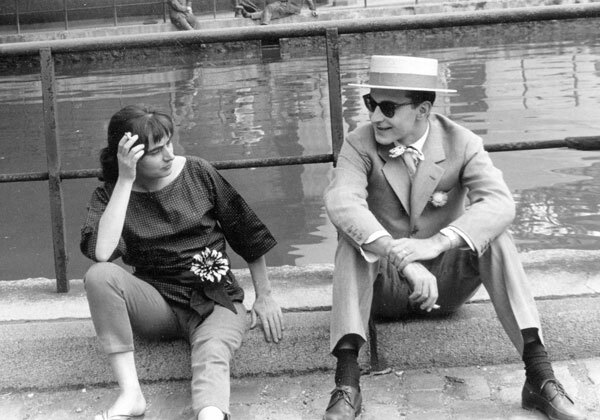 And Godard himself, an old friend about whom Varda guardedly hints at both times of great happiness (she shows JR an early film she shot of Godard and Karina gamboling beside the Seine, looking like love-besotted silent film stars) and the sort of rifts and separations that can mark friendships that span 60 or 70 years, manages to, in a manner, refashion Faces Places itself into his own image, playing the ever-present imp, tweaking the narrative of Varda’s film in absentia like a petulant sibling who must, in the end, have his own way. The riddles, painted on a window pane in code known only to the two directors and left by Godard for Varda to tearfully consider, lead to the movie’s minor-key epiphany of revelation and trust. So, JLG, all is forgiven. 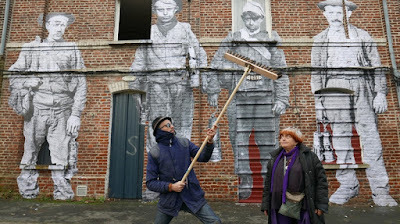 As it should be, Agnès and JR get the last word. We so often talk about seeing films in theaters as communal experiences, and usually that simply means sitting in the same auditorium with a couple hundred people, or maybe just 15 or 20, as it was when I saw Faces Places yesterday, absorbing their reactions, sometimes subliminally, sometimes not—and sometimes putting up with distracting annoyances as well. But “communal” means something specific and different in the terms of Faces Places, even so far as that description trickled down to my own often-audible emotional response to the film itself, directly communicating with those who were sit seated around me as the final strains of the music over the end credits rang through the room and faded away. The woman seated on the row ahead of me and to my right let out a pronounced sigh, which I quickly affirmed. 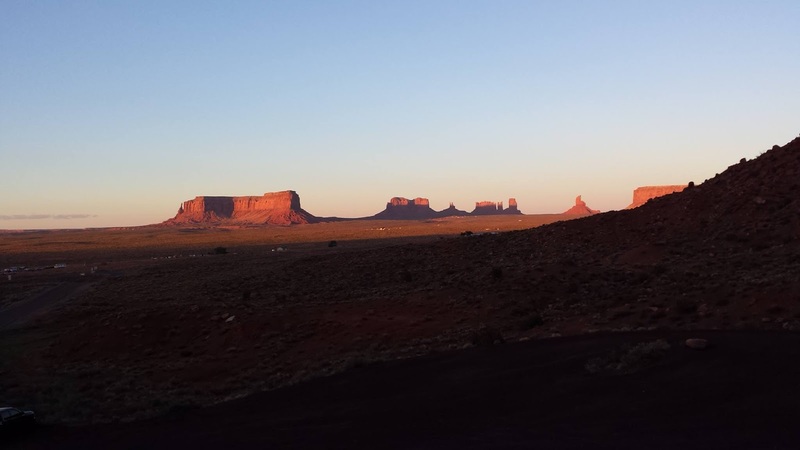 While expressing how much she wanted to come back and see it the next day, she noticed the tears that were still running down my cheeks and admitted that she was having the same problem. The couple sitting one row ahead on my right joined in expressing their happiness, their wonder about the film, and after a short bit of conversation the second woman told me how much she appreciated hearing me laugh throughout. I could only respond that I was grateful my crying was a lot less noisy. That salt plant worker is right. Art should surprise us, challenge us. And when it does, as the resonant simplicity of Faces Places so often does, it can serve to make the world seem like a much smaller, friendlier, more concerned place than it might appear to be when we emerge from the theater into the comparatively harsh light of day. 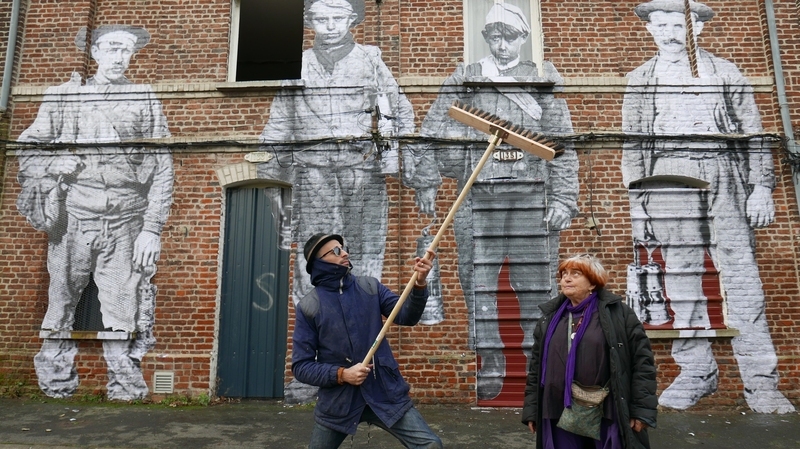 Fortunately, Varda and JR’s art tour through France, experienced in the dark, radiates beyond the dark confines of the cinema. It is cheerful, complicated, subtle; conflicted with memory but alive with the hope of reconciliation; fully conscious of the capability of folks from different classes and backgrounds to show a genuine interest in each other; bright, but with a healthy respect for the long cast of shadow, just like the world outside could be. Leading up to Oscar Night, it’s Muriel Awards season again, the only awards that really matter. (Right? Right!) 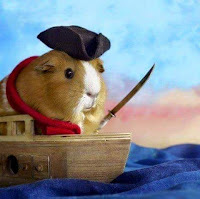 This is, if I am not mistaken, the 10th year of these awards, commissioned and managed and so-named (after his beloved, late pet guinea pig) by consummate movie fan Paul Clark. In addition to participating in the balloting, which differs considerably in its categorial assignations from the Academy and most other critical groups, what I love most about the Muriels is how writer-centric Clark has ensured that the whole enterprise ends up being. Each category comes with a well-written and considered piece from one of the cadre of fine, if less immediately known, critical voices that have been part and parcel of the Muriel Awards since their inception. This year features some new voices to enrich this already inclusive group, and they’re already at it. (I’ve got one coming up later in the week.) Clark began on Friday, after a brief introduction, trickling out word of the winners, and each day over the coming week will see new categories of Muriel winners announced, up until Sunday, February 25, a day which will be dedicated to multiple postings counting down the road to the Muriels winner for best movie of 2017. I would encourage you to follow the Muriels progress all week by clicking on the Muriels home page for the latest updates. But for now, here are the Muriels as they have shaped up so far, as of 7:45 a.m. Sunday, February 18. I offer you the categories only; you’ll have to click to see the winners for yourself, each one perhaps a surprise that even Agnès Varda would appreciate. And who knows? Maybe Varda herself will end up being the oldest Muriel winner too. (Though I suspect the ghost of Manoel De Oliveira might have something to say about that). Much more from Muriel to come this week. Stay tuned. My friend Tom Block, who died last weekend, wrote that brief passage as a Facebook post in April 2015, and he shot the photo too, just over a year before he was diagnosed with the lung cancer that would eventually kill him. Tom was a great traveler and observer of nature and humanity, and after his 60th birthday he took off on a long road trip to see the country. When the trip was over, it wasn’t long before he’d gone back out again. On the road he captured a spectacular series of photographs and documented his journeys with accompanying prose that mused on history, politics, human nature and the interesting people and goings-on at whatever bar he happened to have landed in at the end of the day. 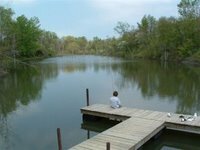 He’d found his calling, it seemed, and to his credit, when he got the bad news he didn’t let a little thing like cancer stop him from living while he was still alive. Reading that passage again, only days after his death, it seems to me to be one which has a lot of Tom Block in it—his precise yet poetic observational ability, his wit, his way with conjuring imagery through words, his admiration for the American landscape, and of course his love for John Ford and the movies. I got to know Tom through that love of movies—we became acquainted through our blogs and through Facebook I’d guess about seven or eight years ago, though I think we may have encountered each other on the old Salon movie forums back in the early days of the Internet. (He was an avid poster there, as was I.) We only ever spent time together in person twice, at that 60th birthday party, which was the first time we met, and at a small gathering of his friends when he was back in Los Angeles, after he’d already begun chemotherapy. I thought of him as a good friend, smart, unwavering in his intelligence, articulate in his opinions and arguments, and about as genuine a man as I ever met. We didn’t agree on everything, of course, but we bonded initially over our regard for westerns (He talked me into trying the videogame Red Dead Redemption for its immersive qualities) and particularly the films of Sam Peckinpah and Robert Altman. Tom was always up-front about his sickness and his prospects for survival, and though I know he had some awful days over the past year and a half, he had little use for sentimentality and faced up to this final challenge with remarkable stoicism and matter-of-fact clarity. As he made his way through his last year, spending months that he cherished in a little cabin in Lone Pine, California, near the Alabama Hills where some of his favorite westerns were filmed, and then even after he returned to Los Angeles and began what would be the last painful chapter in his life, Tom’s reserve and determination reminded me a lot of Robert Altman and how the director faced up to his own health problems and impending demise. Altman chose not to publicize his heart transplant or his declining health (for personal reasons and, most likely, for reasons concerning his potential employment) and instead faced up to it through his art. Of course, this is exactly what Tom was doing in his post-diagnosis travels and his photographic and journalistic diaries, but even to some degree before he was diagnosed as well. There’s an ache that comes in reading of Tom’s awareness that he would never be in Monument Valley again, at a moment like the one he describes, and a sadness that is now inextricably tied to the words he used to end this post: “I’ll try to pick it up later.” But there’s also an element of Tom’s matter-of-factness about the impermanence of the moment, his moment, our moment, left by those words as a final parting gift for everyone who knew him. I thought of the essay in the days just after Tom died because what I saw Altman doing in A Prairie Home Companion reminded me so much of the way Tom faced his own final curtain. I offer it to readers again now, and of course also to the memory of my friend, as a meager way of commemorating Tom’s curiosity, his intelligence, his spirit of inquiry, his undeniable talent as a writer and observer of life, and the regard I had for him simply as a fellow human being. This one didn’t start out that way, but it is now, and forevermore, for you, Tom. And it begins with a quote from Mark Twain which couldn’t describe you any more acutely. A movie bearing the title Penn and Teller Get Killed (1988) has a built-in inevitability which, masters of the perverse and debunkers of tricks and scams that they are, screenwriters/stars/instigators Penn Jillette and Teller would never consider not fully embracing. The movie’s very inertness as a narrative exercise built around an escalating series of deceptions and practical jokes (many of them either derived from or recreated entirely from their live act) seems strangely deliberate too, a willful deflation of the very expectations they themselves have set up. I’m not sure just how much actual cinema most who managed to see this movie in a theater in 1988 thought they were entitled to, but when I bought a ticket to see it during its brief one-week run in Los Angeles I wasn’t surprised by its halting, lurching, episodic structure, and I more or less enjoyed it. Speaking again of inevitability, that very lumpiness seems a natural byproduct of any attempt to impose a filmed story on P&T’s brand of gasp-inducing hijinks, the sort that work to such breathtaking, wisecracking, yet deadpan effect on stage, where matters of editing and camera tricks aren’t an issue. Not that Penn and Teller don’t give camera creativity a fair shot. 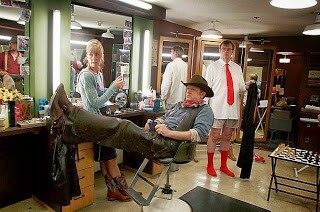 The bit that opens the movie—a talk show appearance in which they use the studio cameras to disguise the fact that they’re seated at a desk upside-down, “levitating” objects through the “magic” of gravity—hints at the ways they might use the techniques of filmmaking to heighten their already ghastly, blackly funny trickery. During the interview that follows, one in which their contempt for the host (and the audience) is barely veiled, Penn feigns exasperation-- or maybe it’s genuine (part of the running P&T joke is that sincerity is almost impossible to discern, and even more unlikely to actually appear)—over how tiresome putting one over on the crowd has become, how blasé their responses to the repeated puncturing of illusion have become. In a typical moment of bombast, he speculates, on national television, how much fun it would be if someone were to actually attempt to kill him and his partner. Their manager (Caitlin Clarke, spewing a curious Mexican accent which eventually morphs into an even less believable Noo Yawk variation) may roll her eyes, but she also sees and dreads the possibilities. It’s an invitation to assassination mounted as pugnacious performance art, and a juicy way to kick off what promises to be a delirium-inducing death dodge of a movie. It won’t take long for even the dullest of viewers to sniff out what it takes a cynically prepared illusion deconstructionist like Teller seemingly forever to figure out—he’s being duped, and we see through it, a strange development indeed. Teller doesn’t wise up until it’s too late, which certainly sets up the sour fulfillment of the movie’s titular promise. But by the time one half of our heroes is hanging by his heels upside-down at the mercy of a maniac, a faint reversal of that first gag in which he and his partner were in control, the manic energy powering Penn and Teller Get Killed has been eaten away, like a chocolate Easter bunny with a hollow center-- nothing inside, most definitely not resurrection, the strains of the Bee Gees’ “I Started a Joke” hanging in the air. The aggressively nihilistic tilt of the movie’s finish might have some bite if what came before were made with anything of the pompous carny glee over the upending of illusionist’s tropes that marks Penn and Teller’s live performances. I kept thinking, upon seeing it again, that the movie needed a magician behind the camera as well, someone like Brian De Palma, whose own cinematic sleight of hand might have meshed well with the macabre irony that is Penn and Teller’s calling card. 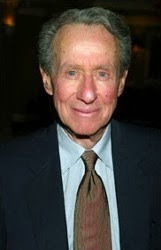 But somehow Arthur Penn ended up directing the movie, and apart from one Penn directing another there’s not much of interest, certainly not the spirit of foreboding or real danger, or even much sensitivity to black comedy, that one might reasonably expect from the director of Bonnie and Clyde and Night Moves. The closest thing to a lark on Penn’s résumé, Alice’s Restaurant, is still weighted with its voice-of-a-generation convictions, but even a jolt of the lunacy coursing through The Missouri Breaks would have been welcome, if only to shake up the static air within P&TGK’s relatively lifeless frames. Instead, Penn directs like a TV veteran marking time, which might seem like the only other legitimate approach to this material were the end result itself less moribund. Penn and Teller Get Killed, which turned out to be Arthur Penn’s last theatrically released feature, stands as little more than the period at the end of a fascinating career, one which in 1967 set the spark to a great, disruptive decade of American film culture and by the end of that same decade had already begun to settle into faint echoes of its own promise. It just so happens that my latest encounter with Penn and Teller Get Killed was prompted by my participation in David Cairns’ Late Show Blogathon, which concludes tomorrow at his Shadowplay blog. The blogathon features writing dedicated to examining and celebrating the final films of famous and/or fascinating film directors, and to my eye, P&TGK made for a perfect example of a once-vital director whiling away his working days, taking a project presumably for the sake of keeping occupied (perhaps with the only work available) and failing to invest much of his own personality and concerns in the process, thus ending his creative journey on a decidedly low note. But when I set to thinking about Penn’s opposite in this regard, a director who was fully engaged and creatively inspired right to the very end of his life, as a filmmaker and on Earth, the first person that came to mind was my favorite director, Robert Altman, and the film that capped his gloriously inconsistent and unpredictable career, A Prairie Home Companion (2006). Based on Garrison Keillor’s only slightly self-conscious throwback to the regional radio variety shows of old, APHC deliberately accesses memories of a near-completely arcane style of programming by calling up faint folkloric echoes of a past that may or may not have even fully existed, at least as anything other than the object of sweet nostalgia. As one character, house detective Guy Noir (Kevin Kline) observes, Keillor’s show, which at the beginning of the film is about to be ushered permanently into memory by the inexorable march of economic progress, has been on the air “since Jesus was in the third grade.” (Or the mid-‘70s, if you value the actual historical record.) The Minnesota theater from which the show has traditionally emanated for all those years has been designated for demolition by a faceless corporation, and what makes up the heart of the film is the salutary last performance by Keillor’s imagined stock company—musicians and actors from the actual Prairie Home Companion stage/radio show intermingled with an impressive roster of actors (including Meryl Streep, Lily Tomlin, Woody Harrelson, Tommy Lee Jones and Lindsay Lohan, among many others) assembled by Altman. The movie begins on a shot of a radio tower at dusk, transmitting voices gathered out of the electric mist of memory. This ethereal opening connects APHC with other Altman movies immediately, most obviously the Grand Ole Opry live radio shows that inform Nashville (and Keillor’s original conception of APHC), the beautifully reconstructed broadcasts that punctuate the milieu of 1930’s Depression-era Kansas in Thieves Like Us, and even the cacophony of a.m. radio advertising that kicks off O.C. and Stiggs. But the device also helps make clear that, rather than indulging an empty exercise in prefab nostalgia, Altman’s film will operate on a mournful frequency of its own. And as unlikely and unexpected as it may seem at first, in its themes and even its basic structure it creates a curious link with Penn’s far less personal and compelling farewell. Both movies, as it turns out, are concerned with death. In Penn and Teller Get Killed, the fascination is superficial, immature, valued only for its ability to shock the presumed bourgeois nature of its audience. (The movie’s meager theatrical and home video audience probably has a far different perspective on itself.) The eventual demise of the entire cast is intended as the grand fulfillment of some nasty cosmic joke. But the punch line has no sting because everything in the movie unfolds in a context in which nothing “real” is ever at stake, where ironic detachment isn’t so much a temporary stance as it is the movie’s lifeblood, a defiant operating philosophy. When the other shoe fails to drop and the bodies remain limp on the floor, we need only imagine that it will do so once the lights come up, Penn’s self-satisfied narration notwithstanding. The slender thread that connects these dissimilar movies turns out to be their relationship to their central performers. Death in both films is a concern that is framed and colored by the reflection of performances derived and adapted from other media. P&TGK reconstitutes vaudeville stage magic but fails to translate any of its mystery, or even (curiously) much of the satisfaction to be had from its debunking, into cinematic language that manages to address the Grim Reaper with anything more than facile attention . Altman, on the other hand, reimagines Garrison Keillor’s dense, theatrically presented universe as one that exists perhaps on the other side of a stage mirror, a world which can only adequately be investigated by the curiosity of his roving camera. 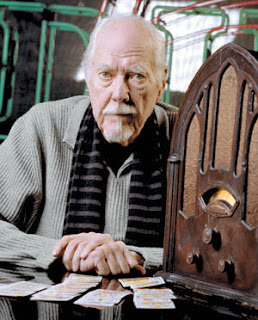 The difference is that Altman feels the quiet urgency underlying his material. Without sacrificing humor or the joy he takes from this latest permutation of the community of performers he has consistently celebrated, whose world he insists we not just observe but inhabit, Altman allows himself to take the terminal trajectory of his subject very seriously. In APHC, as Keillor and Streep and Tomlin take over the dressing rooms, lofts, wings and eventually the stage of the doomed theater, Altman’s gently probing camera finds its corollary in Virginia Madsen’s visiting angel of death. She roams these same spaces, even inhabiting the backdrops onstage during the show, searching out souls which are quite unaware that they are next to depart the material world, in the same way that the theater itself has no clue its days are numbered. Some can see this angel, sense her presence, but most cannot. When the singer/raconteur played by grizzled veteran L.Q. Jones retires to his quarters after his big numbers, the angel takes him quietly, and Altman makes plain his purpose. “The death of an old man is not a tragedy,” says Madsen in a cool attempt to comfort the woman who discovers Jones’s lifeless body. “Forgive him his shortcomings and thank him for all his loving care.” Altman, who knew during production of A Prairie Home Companion (if few else did) that he had only about a year left to live, serves Keillor’s material in the most resonant way possible by fashioning it as his own cheerfully unsentimental goodbye, a valedictory statement on mortality that is in its modest way painfully profound. But, befitting Altman’s career-long tendency to exalt in folly as well as the need for crucial human relationships, whatever the end result, the 81-year-old wheelchair-bound director nimbly avoids the opportunity to turn the movie into either a narcissistic dirge or, in the manner of Hollywood, a hollow triumph of the human spirit. (Or worse, an empty, cynical joke.) There’s room enough, as it turns out, for plenty of humor and spirited exchange even among the shadows of inevitability, as evidenced by the movie’s loving, irony-free recreations of Keillor’s deadpan tales and familiar folk tunes, some of which have been refashioned into dryly hilarious jingles for products you just can’t do without. (“Powdermilk Biscuits, in the big blue box.”) Such generosity is APHC’s primary currency, and Altman spends it well. The movie ends on one of the most gracefully sorrowful of all movie codas, so graceful that even the melancholy it inspires can’t fully dampen the happiness generated by the movie’s love of performance and performers—another consistent Altman trait that links him with the forgiving, unflinching humanism of Jean Renoir. The final show that has made up the film we’ve just seen is months past, and the central cast members, Keillor, Guy Noir (Kline), the Johnson Sisters, Yolanda (Streep) and Rhonda (Tomlin) have gathered in a booth at Mickey’s Dining Car for a reunion of sorts, with ribald cowboy songsmiths Dusty and Lefty (“The Pachelbels of the Prairie, the Brahmses of the Bunkhouse”) seated at the counter. After some relaxed catch-up chatter and a visit from Yolanda’s daughter (Lohan), who has since the end of the last show apparently become an investment counselor-- she advises poor clueless Mom on her retirement portfolio—there’s a cut to a view from the inside out through the rain-spattered window of the dining car. A subtle evocation of the reflections that have played such an integral part in Altman’s visual poetry over the years (think The Long Goodbye, Elliot Gould aimlessly staring at the surf while inside the beach house Sterling Hayden and Nina Van Pallandt argue), the group gathered in the booth can be seen reflected in the window. And just as we registered the double meaning of the neon sign shining “Checks Cashed” into the night, Madsen’s angel of death appears once again from the left of the frame, gazes into the restaurant, sees the group and moves frame right toward the entrance to the diner. There are a couple of cuts to the friends chatting, oblivious to the presence of the figure who has once again made her presence into their lives. She continues to stand silently at the door, watching, and they finally see her. The camera, again assuming her point of view, or at least her observing nature as it has throughout the film, moves in slightly. The four of them are obviously uneasy to be seeing her now—Guy Noir tries to catch her eye, to draw some indication from her as to who it is she’s there for. But she never speaks. She only moves toward them, the stationary camera watching her as she overwhelms the frame. …where we will last glimpse the actors and musicians, in their graceful element, before the credits roll. That Altman could choreograph this moment of reckoning and bliss as his deliberate valedictory to film and to life ought to put a smile on the faces of everyone who has ever cherished the great moments and great movies, and even the less-than-great ones he and his talented collaborators created over the course of a 40-year career as a director. In its terms of clear-eyed summation, love of life and acceptance of what will visit us all (sans the familiar synthetic comforts), Robert Altman’s A Prairie Home Companion might just qualify for me as the finest, most fully realized movie farewell ever made.